Sjögren syndrome is an autoimmune disorder in which the body's white blood cells attack and destroy other cells. It can exist by itself (primary Sjögren syndrome) or develop in association with another disorder such as rheumatoid arthritis, systemic sclerosis, primary biliary cirrhosis, or Hashimoto thyroiditis (associated Sjögren syndrome). Hallmarks are the dry mouth and dry eyes known as the sicca syndrome. Sjögren syndrome affects 1 million to 4 million people in the United States. Most are over 40 years old at the time of diagnosis. Women are 9 times more likely to have Sjögren syndrome than men. The disease is named after Swedish ophthalmologist (eye physician) Henrik Sjögren (1899-1986), who first described it. 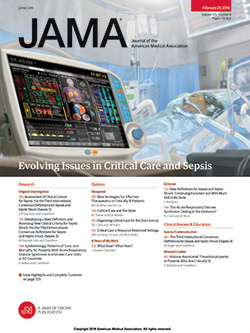 The July 28, 2010, issue of JAMA includes an article about treatment of primary Sjögren syndrome. Although Sjögren syndrome often presents only with the sicca syndrome, symptoms can occur in any part of the body. Dryness of the eyes may severely damage the cornea, resulting in a scratchy or irritated sensation. Lack of tears can cause permanent eye damage. Insufficient saliva can cause cavities and dull taste and smell and make eating and swallowing painful. Dryness of the trachea can result in cough. In one-third of people with Sjögren syndrome, the parotid (salivary) glands become enlarged and tender. One-third of patients may develop joint pain. Lymph nodes throughout the body may enlarge. Nerves, lungs, and other organs may be damaged by inflammation. Debilitating fatigue and pain can impair quality of life. A sensation of dry mouth and dry eyes with joint inflammation is often sufficient to suspect the diagnosis. Tear production is tested for by the Schirmer test (a filter paper strip is placed inside each lower eyelid for 5 minutes). Ophthalmologists test for damage to the cornea (eye surface) using fluorescein staining. A salivary gland biopsy may be required to confirm the diagnosis. Your doctor may also perform some blood tests or other studies. There is no specific treatment for Sjögren syndrome. Treatment of sicca manifestations is mainly symptomatic with saliva substitutes and eyedrops and is typically intended to limit the damage that can result from chronic dryness. Nonsteroidal anti-inflammatory drugs such as ibuprofen may be used to treat musculoskeletal symptoms. People with severe symptoms are treated with steroids or immunosuppressive drugs. New medications such as monoclonal antibodies are under investigation. Prognosis in Sjögren syndrome varies. Many patients have mild disease, experiencing only dry eyes and mouth; others go through cycles of good health followed by severe disease. At any time, disease activity can remain stable, worsen, or go into remission. People with Sjögren syndrome have a higher rate of B-cell lymphoma; those with severe disease are more likely to develop lymphoma. Overall, 5% of people with Sjögren syndrome develop some form of malignancy.